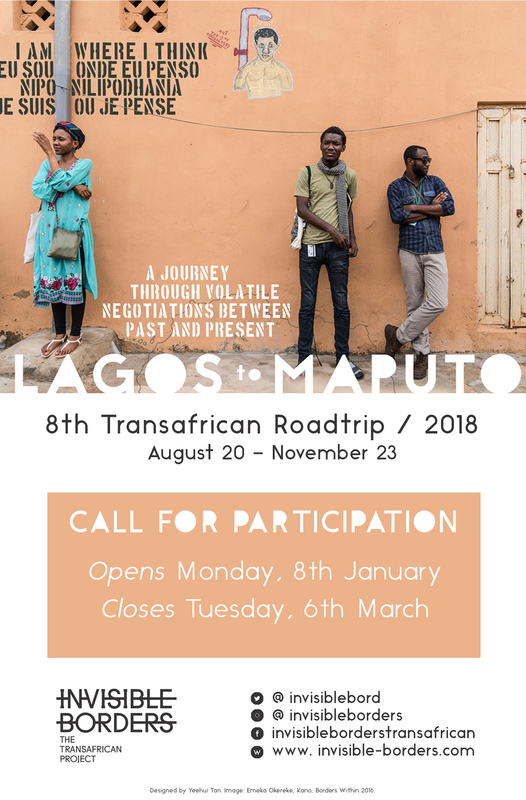 Over the course of 8 years, Invisible Borders Trans-African Organisation has successfully organised seven artistic road trip projects that have served as a form of Trans-African exchange across countries in Africa through various artistic interventions. The projects have mostly seen participating artists travel from Lagos to other parts of Africa, but in 2014 a new dimension was introduced when a transcontinental road trip was organised. The participants travelled by road from Lagos in Nigeria to Sarajevo, Bosnia and Herzegovina. In 2016, the organisation decided to look inward within African countries, and this gave birth to Borders Within. 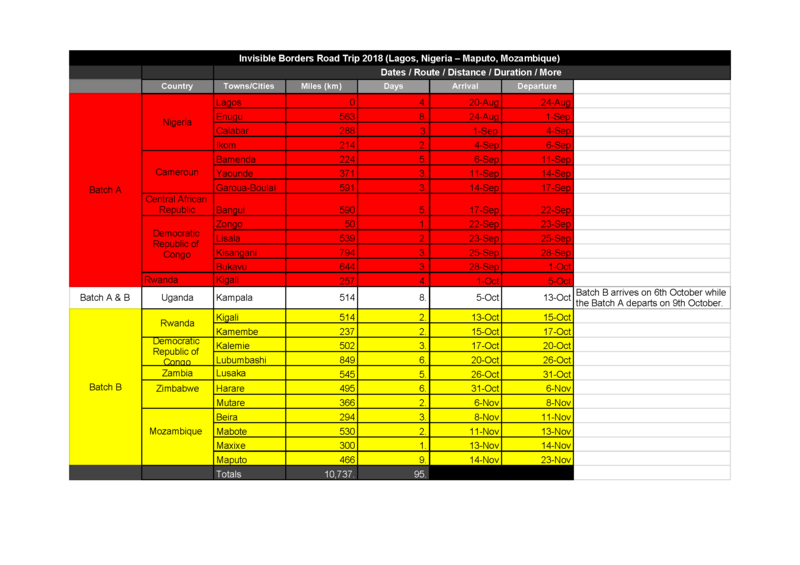 Between 2016 and 2017 there were two editions of Borders Within and both were Trans-Nigerian road trips. In 2018, Invisible Borders Trans-African project will embark on the 8th edition of its artistic Road Trip Project. The Road Trip this time, will be a Trans-African one encompassing countries, towns, villages, rivers and Trans-African highways between Lagos (Nigeria) and Maputo (Mozambique) within a period of 95 days, from August 20 to November 23, 2018. The road trip will feature 21 participants all together (3 administrators, 9 Trans-border participants and 9 guest participants). As has been the methodology throughout previous editions of the Invisible Borders Trans-African Road Trips, participating artists will, once again, employ their bodies as active-thinking bodies, in the negotiation of borders as well as in the re-imagination of histories embodied by this trajectory. Through tangible everyday encounters with stories, events, and happenstances indicative of lives both on the road and at border intersections, the artists will absorb experiences that will be further processed and articulated through their respective mediums of expression and shared on the go, both directly with those encountered and virtually, through a dedicated website blog. We are seeking passionate African artists (photographers, writers, filmmakers, historians, architects, dancers, performance artists, and graffiti artists) who are interested in participating in this road trip. Before you apply, we strongly encourage you to read on the premise and plan for the 2018 road trip HERE. Subscribe to our newsletter and get information. It is important to note, that the road trip in 2018 is predicated–beyond talent, skill and experience–upon an understanding that every artistic endeavour will fall apart without roots in diligence. Consequently, participants, upon selection, will immediately begin to work by researching, gathering, collecting and contributing findings relevant to the itinerary to a common pool of knowledge months before the actual road trip begins. It is also important that prospective participants understand that depending on funding, Invisible Borders will cover the costs of the transportation (air travel and local), accommodation for all the artists and also their Per Diems. However, if there is no adequate funding, artists would be asked to take care of their Per Diem and flight to the take off point for the project. Invisible Borders will communicate the final terms of participation to the participants before the road trip, giving them ample time to prepare. Please, ensure to read the instructions clearly before filling the application form or uploading any document requested, as we will not work with any entry that does not follow the given instructions. To apply, you must be an African (living in Africa or in Diaspora) most preferably with an international passport from an African country. If you do not have a passport from an African country, you should demonstrate in your motivation letter your connection to Africa. You are to apply either as a Guest Participant or as a Trans-border Participant. Guest Participants are artists who will partake only within the borders of one out of the countries covered in the scope of this road trip. There will be a total of 9 guest participants (for the nine countries that would be covered). Guest participants must come from the country they’re participating in (for example, the guest participant in Uganda must be from Uganda and will only participate all through Uganda). Selected applicants are still subject to change if their pre-road trip participation falls short of the organisation’s requirements. As stated in the Open Call, this road trip will be immersive and there will be need for serious pre-road trip work. It is very important that artists applying as Trans-border Participants have valid passports (valid up till 2 months after the road trip) before applying. Applicants interested in partaking as Guest Participants have to be architects, graffiti artists, performance artists, dancers, writers, photographers or filmmakers. Applicants interested in participating as Trans-Border participants have to be writers, filmmakers, historians or photographers. All applicants interested in participating as Trans-Border participants must be available for the entire duration (95 days) of the project as selected applicants would be drafted into Batches as we deem fit. To avoid any confusion, all applicants are required to label their documents and upload with your proper names before uploading. If you have questions, contact info@invisible-borders.com, or reach out to us on any of our social media accounts. Design by Yeehui Tan. Cover Image by Emeka Okereke. Hint: Besides talking about your work and what it means in the context of the project, we’d like for you to sufficiently demonstrate your reason for choosing to come on this road trip and how you’d fare in a collective context whereby you are required to create work and be in constant movement with your fellow participants.